I have a wasp and hornet problem. Every year at this time I have a wasp and hornet problem. The wasps and hornets are fueling up for winter or migration or something. Frankly I have never bothered to look it up. But whatever it is, they are in my bird feeders chasing off all my birds and making my patio a no-go-zone for us too. Of course I could just move the bird feeders farther away from the house but what is the point of having bird feeders if the birds cannot use them. The wasps and hornets are mostly a problem for the humming birds and Orioles who will be migrating away to warmer climates very soon. And that is why it is very important that the migrating birds are able to get to the feeders they have been relying on all summer. Which is why I need to do something about the wasps and hornets. I use a very simple trap made of what you see below. You need an empty water bottle. Any plastic bottle will do but water bottles are easier to cut through. You also need some string or twine or something similar from which the trap will hang (I have even raided my daughters art supplies for pipe cleaners in years past). For tools you need scissors, a single hole punch, and a stapler. Lastly you need something to bait the trap. More on that later. The first thing I do is remove the wrapper from the bottle. You do not need to do this but I prefer to not leave the labels out there swaying in the breeze on my patio. Oh and you do not need caps for the bottles. Next you cut the top of the bottles off. It works best if you cut just above where the top of the bottle finishes tapering off to the full shape of the bottle's main cylinder (the part you hold in your hand). I just squish the bottle in my hand and cut through with scissors. You are not going for looks here so quick and dirty works fine. With the tops cut off the bottles look like this. Next invert the top back into the bottle so it looks like a funnel sitting in the top of the bottle. 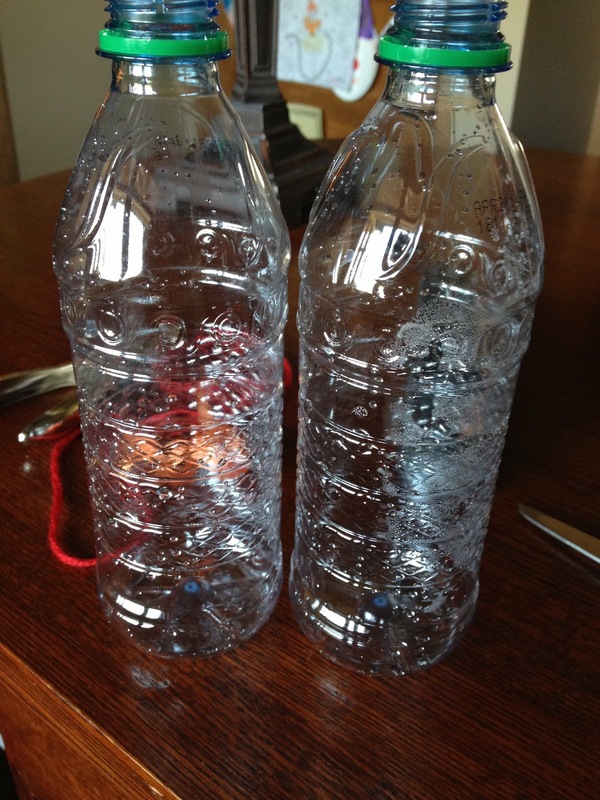 Then staple the inverted top into the water bottle. Three staples is enough. Next punch two holes in the top of the bottle. You want the holes to be pretty much directly across from each other since these are where you are going to tie the string (or other hanging material). Now tie your string, yarn, ribbon, pipe cleaners, or what-have-you to the bottle through the two holes you just punched. Ta da! You have made a wasp trap. Now you need to put some bait into the trap or, well, it just isn't going to trap anything. I have tried sugary soda, pancake syrup, humming bird nectar, jelly, and many other sweet sticky things. And what I find works the best is orange juice. The amount of sugar in orange juice is alarming. But the wasps like it. 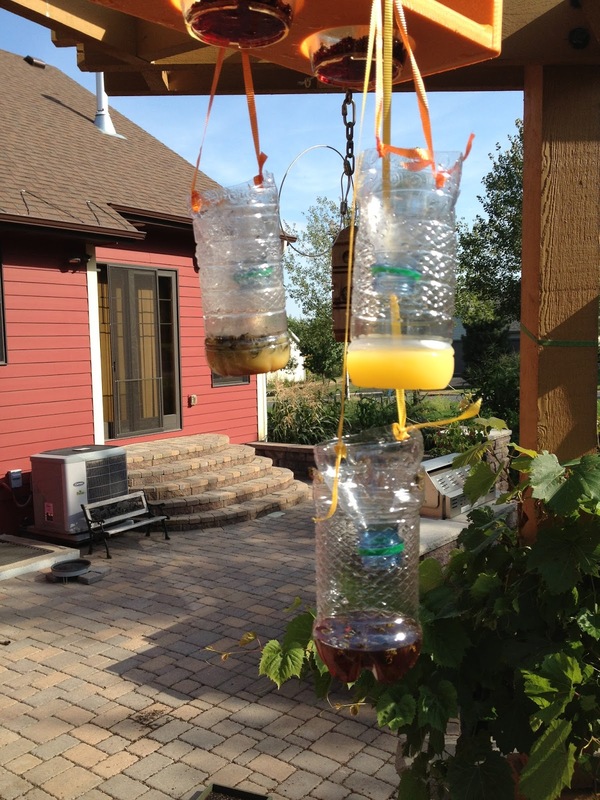 Put about an inch of so of orange juice in each trap. The sugary sweet smell of the juice will attract the wasps away from the bird feeders. The wasps have to climb down into the inverted bottle opening. Then they have some juice. But when they try to leave they can't. Actually if they had bigger brains they could. But they have tiny wasp brains so they try to fly out and can't so they are trapped in the trap. Eventually they fall into the juice and die. Not how I would wish them to die but if it comes to the wasps verses, me, or my little girl, or my birds, the wasps are gonna get it. The last step is to hand the traps near where they are already congregating. I find the wasps are more attracted to the orange juice than the feeders so the birds can get to the feeders in relative peace. OF course there are still some wasps and hornets buzzing around but a few don't bother the birds much. It is when they swarm 15 or 20 at a time around the feeders that the birds give up. If you try this, let me know how it works for you and if you find a better bait than orange juice.